Experience the fastest Green Screen Photo Favor Service in the industry! Our proprietary software is tailored for extremely fast, high-volume print outs so you get more photos for your money! We use professional DSLR Cameras, the fastest Dye Sub Printers in the market, and the same software used at theme parks like Disney World...so your guests will be amazed! You'll receive a digital master copy of your photos! 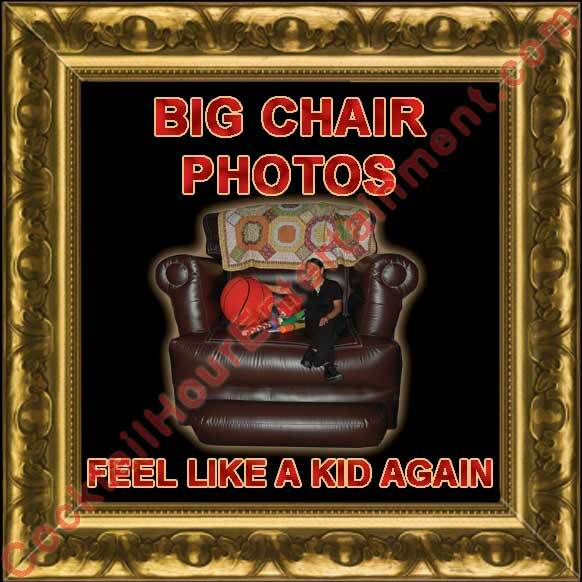 Most Photo Packages include unlimited photos, picture frames, and our free TV Preview System. 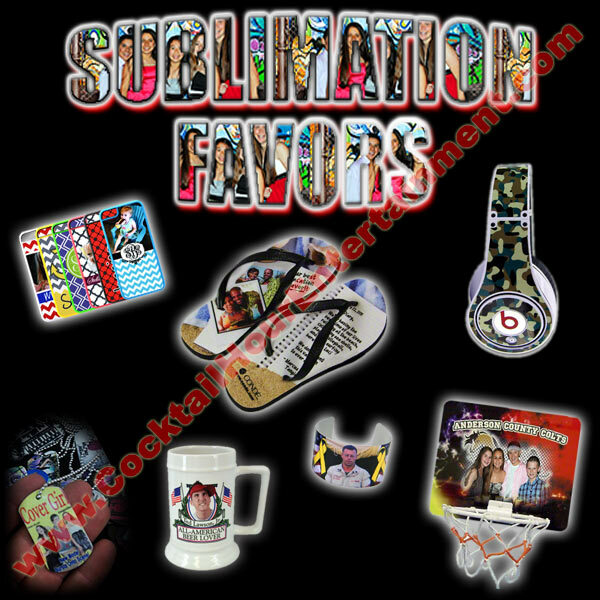 We can customize any package below to fit your Bar Mitzvah, Bat Mitzvah, or Corporate Event budget. We will do our best to match Competitor Pricing! Green Screen Photos, Prop Shop Costume Photos, Photo Favor Level #1, Level #2, Level #3, Level #4, DigiPix/3D Pix/Flip Pix, Red Carpet Photos, Novelty "Fake" ID Cards, Movie Posters, Magazine Covers, Flip Book Photos, Phone Cases, Hologram Phone Cases, Polaroid Photos, Photo Sticker Station, Sublimation Favors, Big Chair Photos, Funny Photos, Rock Star Photos, Hip Hop Photos,Trading Cards, Digital Photo Frames, Logo & Date Of Affair Printed On Photos, Custom Banners, and more! How It Works: Guests choose a background design from our Display Banner with 70 fun choices! photo with the design BEFORE it's printed! Our commercial green screen software and printers are the fastest in the industry! Photos are printed out and framed in 7 seconds! Your guests do not have to wait until the end of the party to get their photos! Cardboard Matte frames are included, but you can upgrade your frames, print them as photo stickers, or give out personalized pocket albums. the photos, but master copies from most companies DO NOT! Their master copies are just plain pictures of your guests standing in front of a green screen. are printed dry...no wet ink! Theme-Related and Custom Backdrops are available. 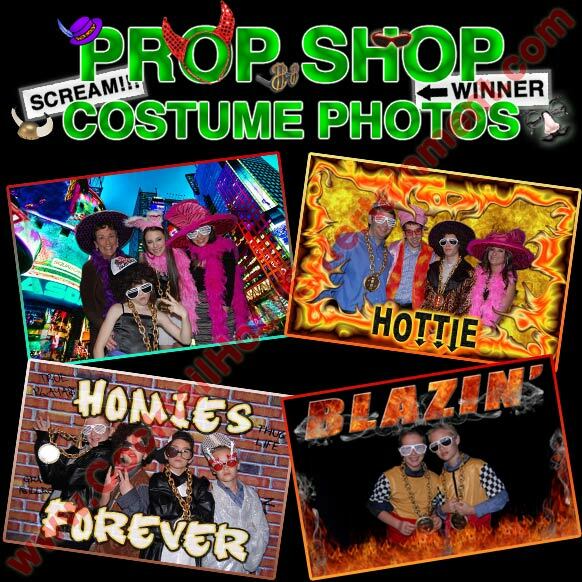 Prop Shop Photos is our Green Screen Photos but now we are adding hats, wigs, sunglasses, signs, costumes, and a costume attendant. Guests can strike a pose or dress up to be a SuperModel, Hip Hop Artist, Rock Star, or anything else they can imagine. We Provide The Props and Digital Backdrops of your choice to go with any Theme or Decor. 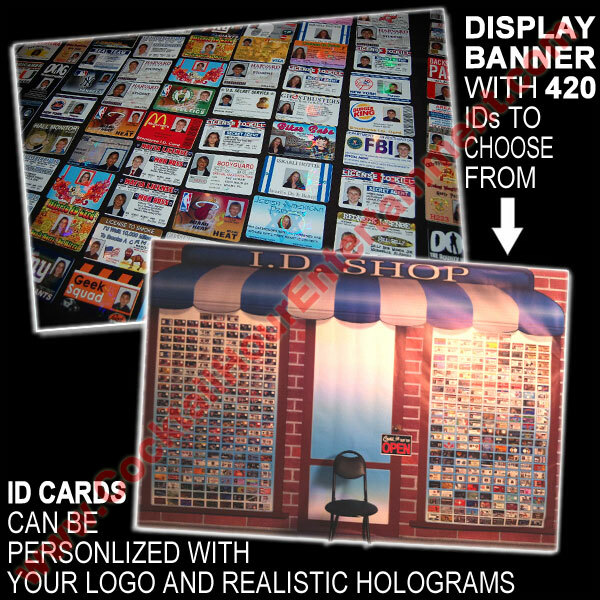 Your Logo or Artwork can be incorporated into the Digital Backdrop as well! 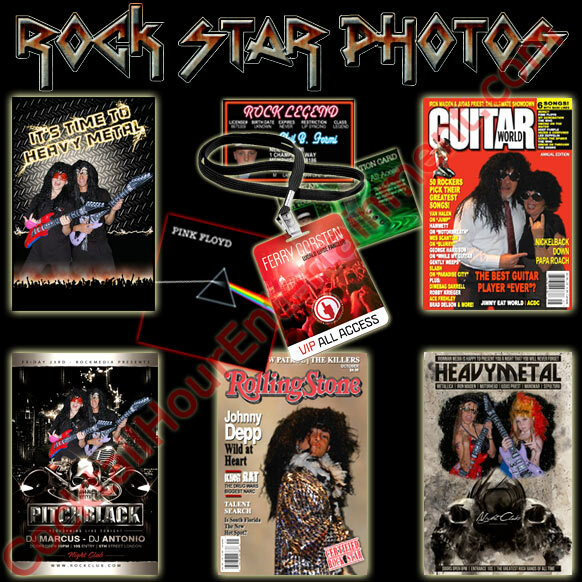 · PHOTO KEYCHAINS -any of our 70 design choices can be printed onto our keychains! 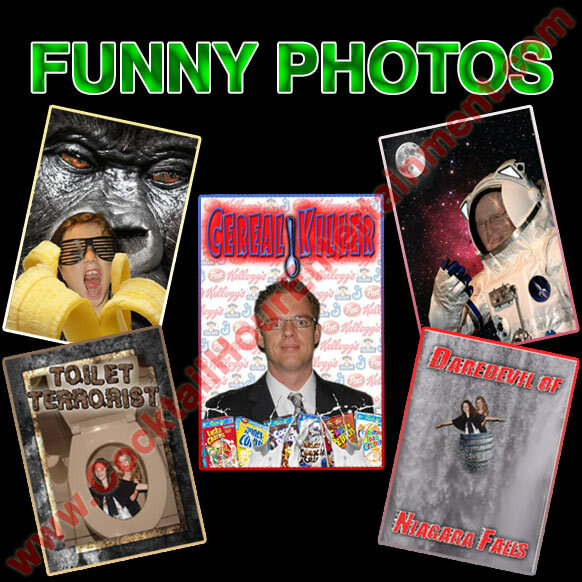 · PHOTO BUTTONS clip these high quality 3" photo buttons anywhere. Our photo buttons have a clear mylar layer that protects the photos and gives them a professional look! dice, hearts, and more. All swimming in assorted colored water-based acrylic frames! 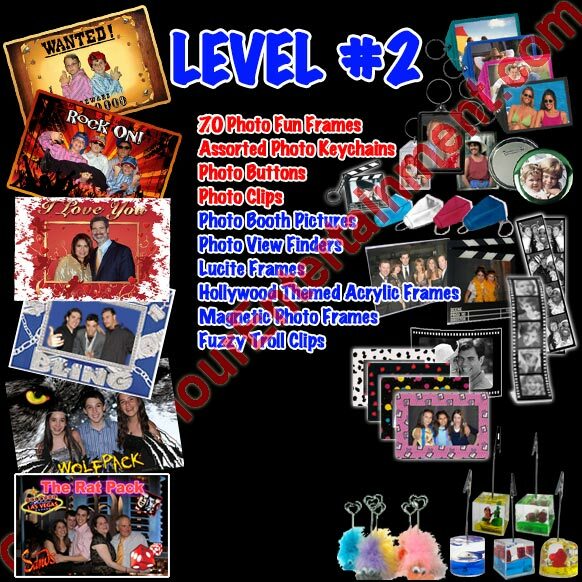 · EVERYTHING FROM PHOTO FAVORS LEVEL 1 IS INCLUDED! · PHOTO VIEW FINDERS remember these from the catskills and coney Island! · LUCITE FRAMES clear frames that are perfect for group shots of your friends and family. · HOLLYWOOD THEMED ACRYLIC FRAMES! · MAGNETIC PHOTO FRAMES assortment of colorful magnetic picture frames. Fits 4X6 Photos! · FUZZY TROLL CLIPS moving eyes, neon hair, and a heart shaped clip for your assorted photos! 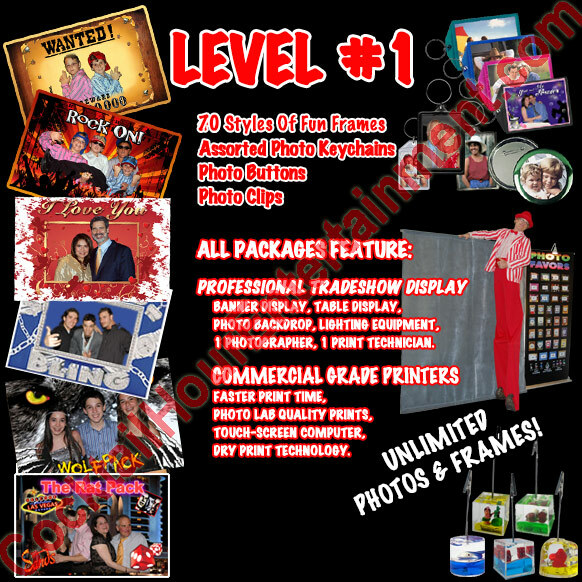 · EVERYTHING FROM PHOTO FAVORS LEVEL 1 & 2 IS INCLUDED! · MOUSE PADS 4x6 Photos slide inside a hidden sleeve in these high-quality, assorted Mouse Pads. · Color Photo Dog Tags with Black Rubber Silencers! · FURRY FRAMES 4X6 furry frames in assorted solid colors. · ANIMAL PRINT FRAMES 4X6 furry zebra, leopard, and cheetah frames. · DENIM JEANS FRAMES 4X6 denim jean fabric frames. · MIRROR COMPACTS black compact case with regular and close-up mirrors enclosed! · SPORTS FRAMES Soccer, Baseball, Basketball, Football shaped frames and photo clips. 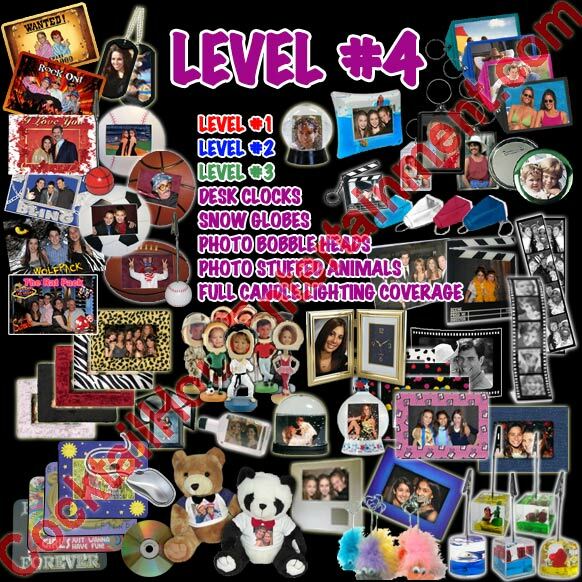 · EVERYTHING FROM PHOTO FAVORS LEVEL 1, 2, & 3 IS INCLUDED!! · DESK CLOCKS perfect for family shots! · SNOW GLOBES choice of assorted snow globes, photos are placed inside the snow globes! · PHOTO BOBBLE HEADS over 20 different styles to choose from! · PHOTO STUFFED ANIMALS assorted quality 10" plush animals! Choose 3D Pix, Flip Pix, and Digi Pix in the same package! 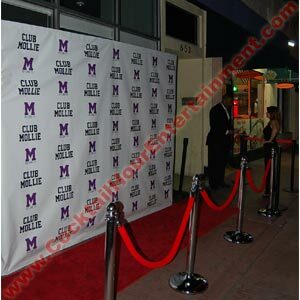 We bring the Red Carpet...You bring the Stars! photo! Works great with a Joan Rivers or Ryan Seacrest Impersonator! You can have your own I.D. Shop at your party! We created a lifesize store front (10' wide x 8' tall). print real drivers licenses! You will recieve a digital master copy of all the printed ID cards. 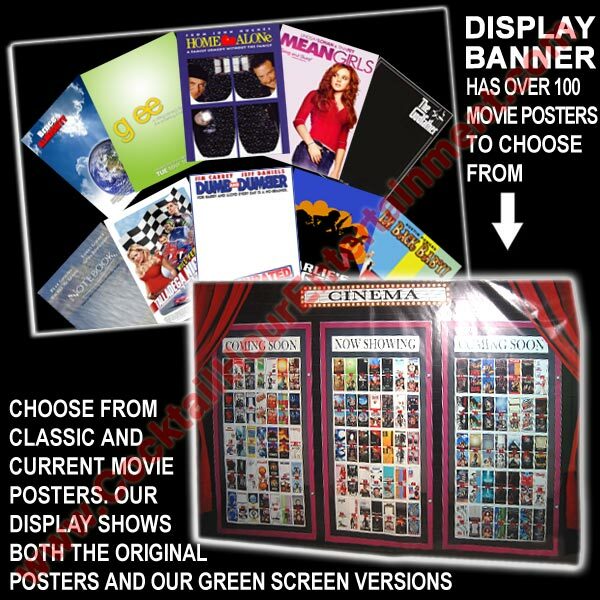 choices on our giant banners so it is easy for your guests to choose their favorite selections. 1) Green Screen Movie Posters: Your guests are inserted into the Movie posters in place of the actors. 2) Heads on Bodies: Your guests will have their Heads/Faces inserted onto the Bodies of our many different Celebrities. FYI: Most printers take 60+ seconds to print 1 photo quality 6x8 photo! Our Printers use a dry ink technology so photos are printed dry...no wet ink! 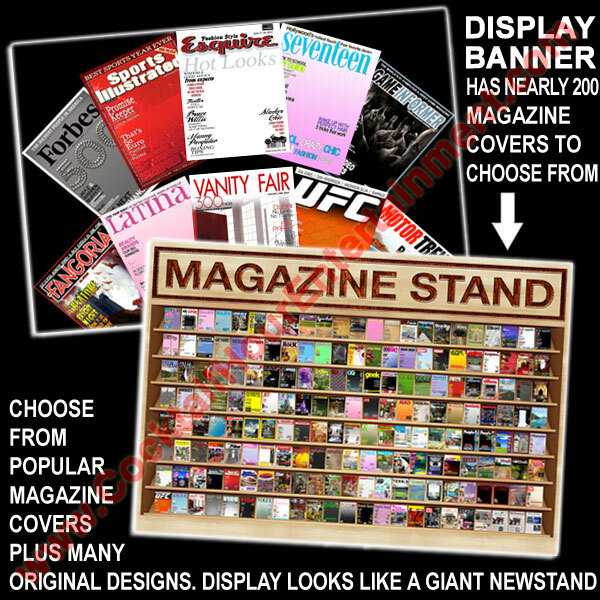 Your guests get to appear on the cover of almost 200 different magazine covers! No one offers this large of a selection anywhere! We bring you both Quantity AND Quality! Our graphic art department worked hard because we value your business. Your guests will get 60 color pictures assembled into their own mini-animated Flip Book movie of themselves! and invite each of your guests to step in front of the camera and make a short video clip. 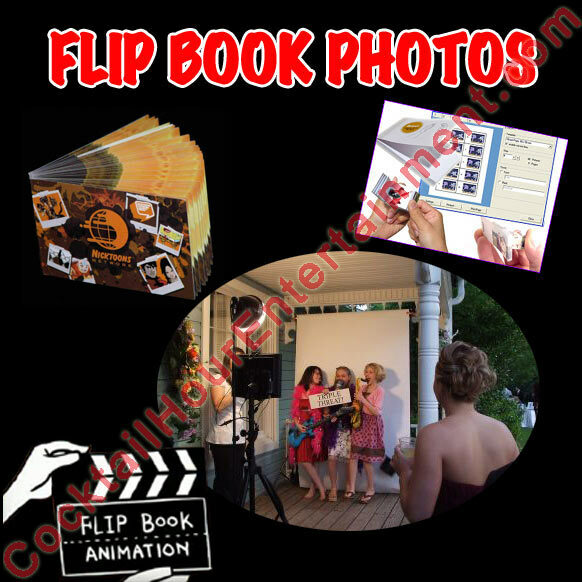 We provides all kinds of fun props and create your Flip Book from a 7 second video. In about 90 seconds, we print, cut, and bind your video clip into a personalized Flipbook while your guests are watching! Our Green Screen Flip Books can have your Artwork & Date-of-Affair on the cover or backround at no additional charge. We will do our best to match any Competitor Pricing! photo in realtime, and that's it! Our Phone Cases are not stickers! your money. 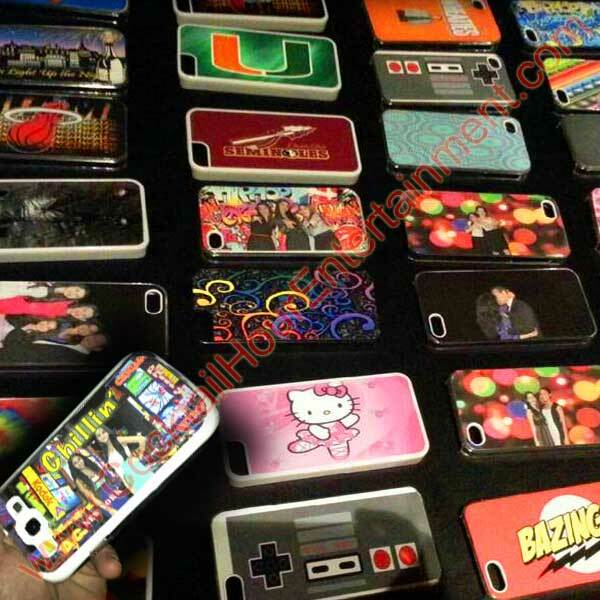 Using this same system we can also do Flip Phone cases or a custom 3D design! See below for our new 3D Flip Phone cases. the design. When you rotate the phone cases or view it from a different angle the design changes! photo stickers for your event. Your guests get their photos printed out as reusable stickers that can be applied anywhere! else you can imagine! Our photo stickers are photo quality, waterproof, and your guests can print as many as they want! TV preview system. 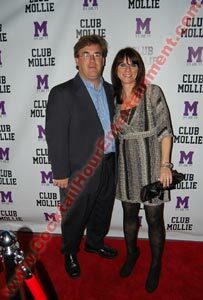 We include a free digital master copy of all the photos taken at your event. We believe our photo services are the best in the industry! The latest social media craze...Polaroid prints. You wont have to shake these photos and wait for them to develop. or we use a green screen background and your guests choose their favorite backgrounds. Our polaroid style photos are photo quality, waterproof, and your guests can print as many as they want! and we include our free TV preview system. 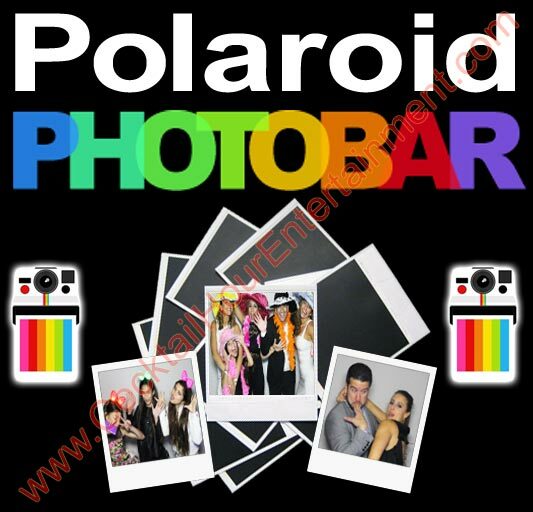 We include a colorful Polaroid Photo Bar display banner as well. so the heat press operator can't lose track of time and burn items! that most inflatable companies sell. Sit alone with an over-sized baby bottle or take a group shot with 6 of your friends! in 7 seconds per print! FYI: Most printers take 45+ seconds to print 1 photo-quality 4x6 photo! Magazine Covers, Fun Frames, Posters, Backstage Passes, and I.D. Cards. Graffiti Walls, Subways, Magazine Covers, Album Covers, and many more! These are realistic designs created by our in-house graphic artists. 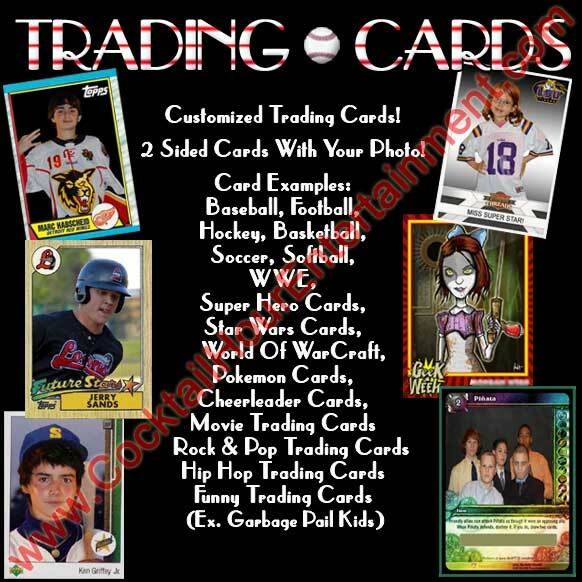 Basketball Cards, Tarot Cards, Playing Cards, World Of WarCraft Cards, or anything you can think of! Cards are placed in protective card holders for a more authentic look and feel. Digital Photo Frame: Add to any package, Artwork Included. Guest Photos are printed out with a customized digital frame printed over their photo. Clear frames or keychains recommended! Photos now have the added element of a custom digitized border! corner of your photos with your Name & Date of Affair. Logo & Date Of Affair : Add to any package, Artwork Included. You supply the logo or we'll create one for you. Guest photos have your logo printed over their picture. Clear frames recommended! Guests now have a permanent reminder of when & where their photo was taken! b/c the designs are already printed on the photo. Kids can just keep adding more photos to their very own photo album. Your guests will now have a simple, organized way to keep all their photos from your event in one organized album! Full Color Murals, or anything else you can dream up! 8x10 vinyl backdrop with end caps. We do not use Pipe & Drape! 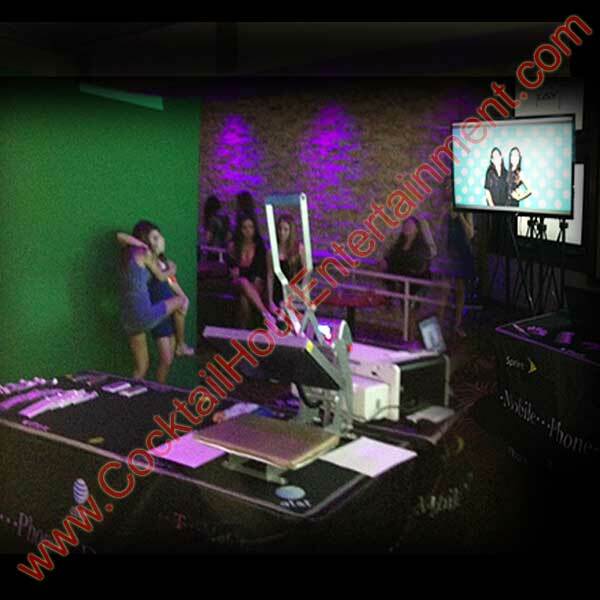 Cocktail Hour Entertainment provides green screen photo services for the cocktail hour at your Bar Mitzvah, Bat Mitzvah, Corporate Party, or other Special Events. Our services are available for just cocktail hour or for the entire party.